This here post is for all you folks who LOVE brownie edges. 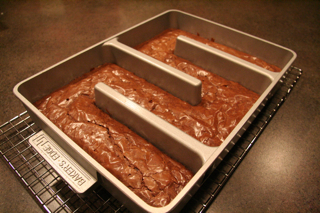 If you’re at all like me – you tend not to venture too far away from the edge of the brownie pan. In fact, you eat all around a pan of warm brownies, enjoying every morsel of chewy-edge bliss before leaving the comfort and safety of the brownie pan. 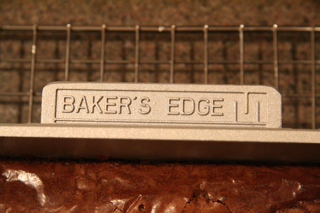 I was fortunate to receive a modern baking miracle called the “Baker’s Edge” baking pan for Christmas. The designer of this pan is an absolute genius, I wish I had thought of this first. See the pictures below and purchase one of these bad boys for yourself. It surely won’t disappoint.